Neovascular age-related macular degeneration (nAMD) is induced by the development of new abnormal ‘leaky’ blood vessels in the choroid and retina, when the balance of pro- and anti-angiogenic factors is upset. Vascular endothelial growth factor (VEGF) is considered a critical modulator of angiogenesis and is related to induction of endothelial cell migration and proliferation after hypoxia. The development of anti-VEGF agents, such as bevacizumab (Avastin®), ranibizumab (Lucentis®) and aflibercept (Eylea®), revolutionized the treatment of nAMD. Despite the success of anti-VEGF therapy, many nAMD patients don’t respond to anti-VEGF agents fully. Resistance to anti-VEGF therapy can be established in several causes: tolerance or tachyphylaxis to anti-VEGF drugs, alteration of the neovascular architecture, compensatory mechanisms, alternative angiogenic pathways, and genetic variations. The key to developing better treatments is to find out which other factors may maintain the angiogenic stimulus despite VEGF blockage. The levels of these alternative pro-angiogenic factors increase soon after the intravitreal bevacizumab injection, and become significantly higher at the second month follow-up. Eleven other molecules (bone morphogenetic protein 9, epidermal growth factor, endoglin, fibroblast growth factor-1 and -2, granulocyte colony-stimulating factor, leptin, placental growth factor, tissue inhibitor of metalloproteinases-1 and -2, and VEGF-D) did not show statistically significant differences in their levels. Corroborating other studies, we evidenced that optical coherence tomography parameters (central retina thickness, macular thickness and macular volume) significantly improve earlier than visual acuity, at 1- and 2-month follow-up period, respectively. Although the anti-VEGF treatment of nAMD has a favorable effect on disease progression, an anti-VEGF drug alone seems to be insufficient to treat all neovascular lesions. The mechanism of resistance to anti-VEGF therapies is not totally understood. One explanation may be that there are other important angiogenic targets that are not addressed by the current anti-VEGF agents. Also, it is possible that a downregulation of VEGF may lead to an upregulation of other angiogenic pathways. Our findings reinforce the hypothesis of a compensatory mechanism when VEGF concentration is reduced which sustains the neovascularization stimuli in nAMD and may be responsible for the persistent and recurrent neovascularization after anti-VEGF therapy. Suppression or downregulation of any of these seven biomarkers may provide a new therapeutic approach for nAMD. Furthermore, more complex study designs, with larger samples and different angiogenic factor inhibitors, will help us to understand the pathophysiologic features of nAMD. The impact of combined treatment in the management of ocular angiogenesis and VEGF mediated diseases besides nAMD, such as Diabetic Retinopathy and Retina Vascular Occlusion, is the goal for upcoming years. 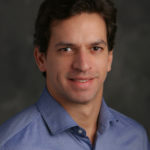 1 Dr. Cabral is an Adjunct Professor in Ophthalmology, Department of Specialized Medicine, CCS and Vision Center Unit, Ophthalmology EBSERH, HUCAM-UFES – Federal University of Espírito Santo (UFES) and a Research Associate at the Department of Ophthalmology, Federal University of Sao Paulo (UNIFESP). He wrote this article at our request. Posted in Age-related Macular Degeneration, Branch Retinal Venous Occlusion, Central Retinal Venous Occlusion, Diabetic Retinopathy, Pharmaceuticals/Drugs and tagged Aflibercept, AMD, anti-VEGF, Avastin, Bevacizumab, diabetes, Diabetic, Diabetic macular edema, DME, Eylea, Lucentis, macular degeneration, nAMD, Ranibizumab, VEGF.